I recently discovered that a box of what I thought was saved business correspondence belonging to my paternal grandfather also contained personal correspondence relating to the search for family information. Tucked away inside these letters were also some clippings and photos, among them, my grandparent's wedding announcement. 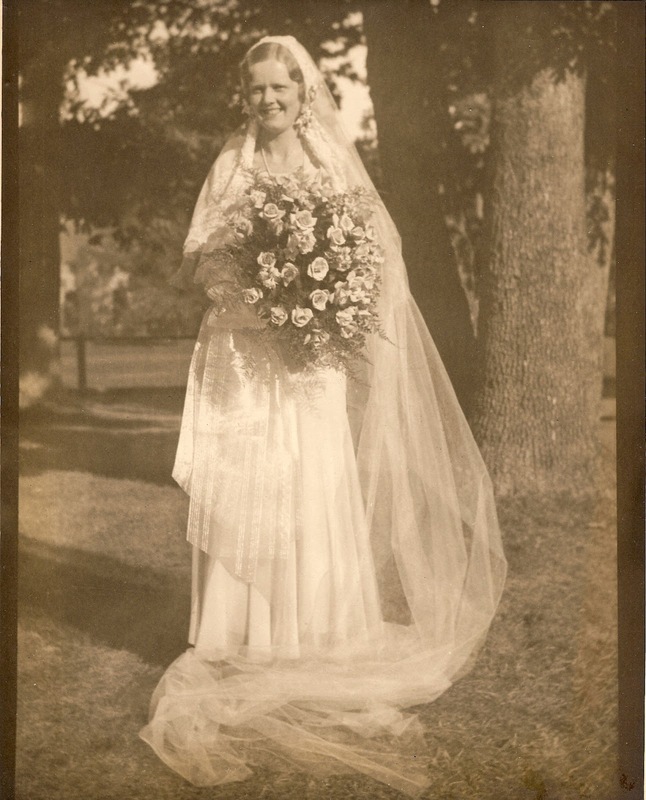 It is another reminder that I have to ask my stepmother for my dad's home movies that include some wedding footage, although I do have this wonderful photograph of the bride and her gorgeous bouquet. Miss Dagmar Viola Anderson, daughter of Mr. and Mrs. Carl J. Anderson of 68 Garden street, will be married this afternoon to Howard Beirly Matthews of New York City. The marriage will take place at the home of the bride's brother and sister-in-law, Mr. and Mrs. E. C. Anderson of 34 Elm Terrace, at four o'clock. Dean W. G. Chanter of Wesleyan University, Middletown, will perform the ceremony, using the single ring, Methodist service. The bridal music will be played by Mrs. A. H. Anderson, and Mrs. Charles A. Matthews will sing "I Love You Truly." 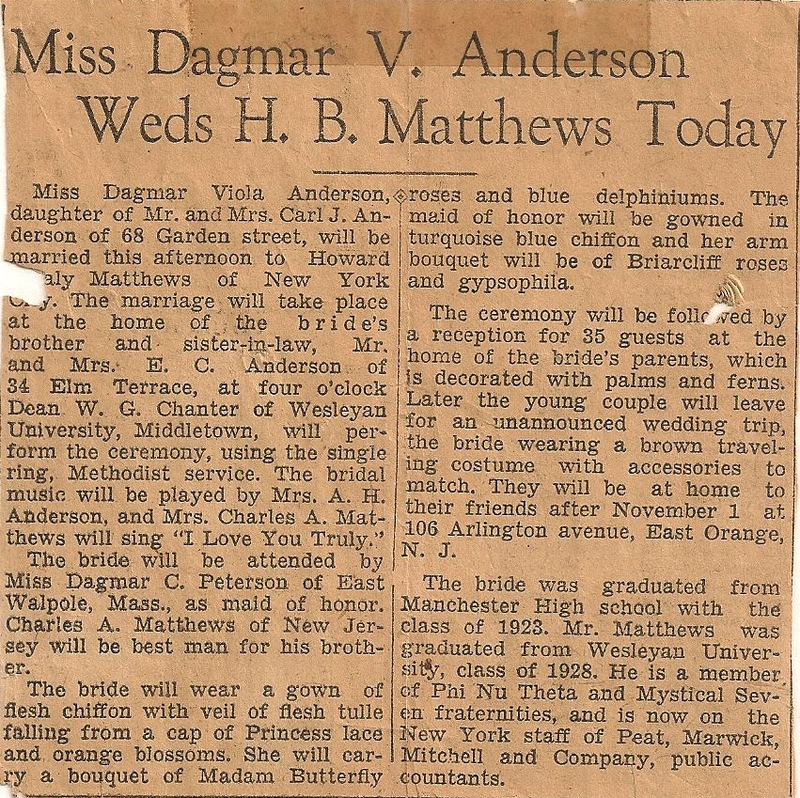 The bride will be attended by Miss Dagmar C. Peterson of East Walpole, Mass., as maid of honor. Charles A. Matthews of New Jersey will be best man for his brother. The bride will wear a gown of flesh chiffon with veil of flesh tulle falling from a cap of Princess lace and orange blossoms. She will carry a bouquet of Madam Butterfly roses and blue delphiniums. The maid of honor will be gowned in turquoise blue chiffon and her arm bouquet will be of Briarcliff roses and gypsophilia. The ceremony will be followed by a reception for 35 guests at the home of the bride's parents, which is decorated with palms and ferns. Later the young couple will leave for an unannounced wedding trip, the bride wearing a brown traveling costume with accessories to match. They will be at home to their friends after November 1 at 106 Arlington avenue, East Orange, N. J. The bride was graduated from Manchester High School with the class of 1923. Mr. Matthews was graduated from Wesleyan University, class of 1928. He is a member of Phi Nu Theta and Mystical Seven fraternities and is now on the staff of Peat, Marwick, Mitchell and Company, public accountants.